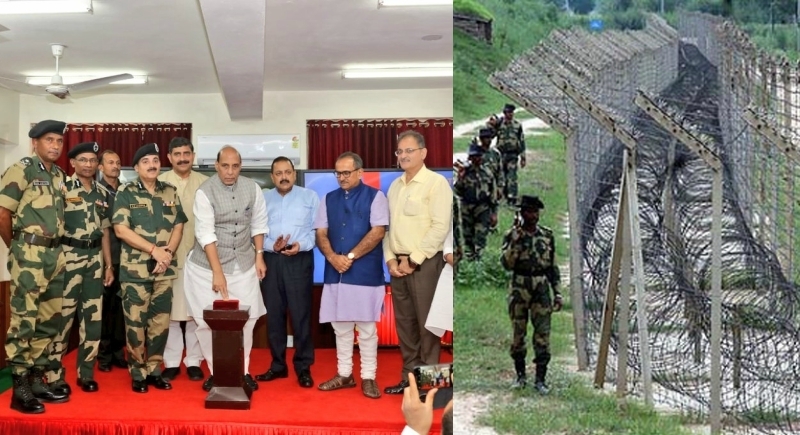 Jammu, September 17: Home Minister Rajnath Singh on Monday inaugurated India's first 'smart fence' pilot project along the Indo-Pak border at the BSF Headquarters in Ploura, Jammu. Notably, the pilot project entails deploying laser-activated fences and technology-enabled barriers to plug vulnerable gaps along Indo-Pak borders. The system provides for round-the-clock surveillance on the border and in different weather conditions be it dust storm, fog or rain. Smart fencing uses a number of devices for surveillance, communication and data storage. While inaugurating the first 'smart fence' pilot project, Rajnath Singh said that the central government is making maximum use of modern technology to make the security system at the borders more strong and effective. He further added that smart fencing at the borders is the technological solution devised to address the security issues and it will virtually make it impossible for terrorists to infiltrate into this side of the border. The Minister also stated that the shortcomings of the pilot project will be addressed to make the Comprehensive Integrated Border Management system foolproof before it is extended to other areas. During his day-long visit, Home Minister Rajnath Singh will also hold a review of the situation prevailing along the International Border in Jammu region with top officials of BSF.